IoT (Internet of Things) is at its nascent stage. However, it has a bright future. Most of the enterprises, mostly those from the service sector, according to Mckinsey, are ready to adopt it at some point of time in near future with a bid to gain a competitive edge. Wondering what is paddling the IoT adoption? What kind of IoT applications are required, and what should be the course of action for an IoT application development company? 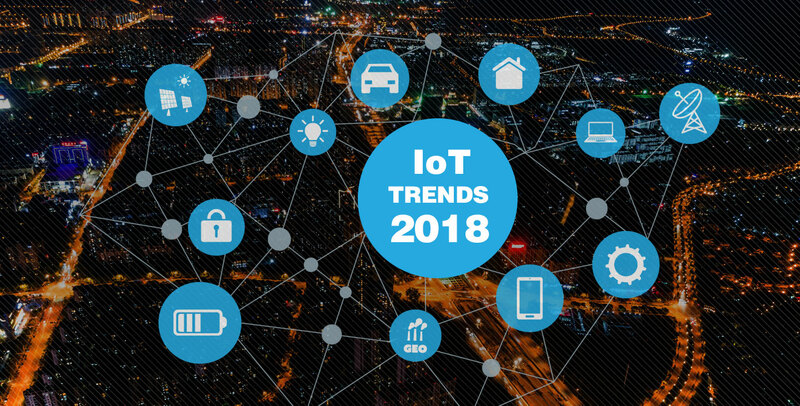 If you answered yes, take a look at the top trends that you can expect from the world of Internet of Things in 2018. Introducing software- as-a-Service IoT platforms, Microsoft, IBM, and SAP or several industrial companies have made it cost-efficient and faster than ever to adopt IoT. Leading enterprises to the likes of GE, Bosch, and Siemens are already reaping the benefit of it. The pay-as-you-go model takes away the concerns related to budget and deployment hassles. However, IoT application development companies need to strategically create custom applications that can sync with the IoT platform and challenge the business challenges efficiently. Once legacy premise-based software applications were substituted by cloud-based ones, and then web-based ones with the mobile apps. Now, it seems the demand for IoT application development is all set to erode them all. Around 18% respondents who participated in a survey by Forrester admitted using IoT while 28% expressed interests in embracing it in the next couple of months. So, the demand of IoT app development services is to soar. Gartner estimates that the demand for enterprise application development is to outstrip the supply by 5 to 1. Thus, enterprises are reeling under pressure to fulfill their technology requirement. To get rid of the deficit, they can hire more people; however, that will not come without a handsome investment. The number of objects connected with the Internet of Things is expected to reach between 6.6 billion to 30 billion by 2020, according to Statista. In the wake of it, the pressure to create secure mobility solutions is mounting high on IoT developers. Moreover, BYOD (Bring Your Own Device) implementation and deployment ask for added layer of security because enterprise data often goes beyond the physical contact of enterprises. According to a Mckinsey report, enterprises invested a whopping sum between $26 billion and $39 billion in 2016 to adopt artificial intelligence. While high tech/telecom companies remained the early adopters of IoT, automotive and financial services remained at number two, and hospitality, healthcare and educations at the bottom. Indeed, the bottom industries will catch up AI over the time. However, with IoT becoming the backbone of today's infrastructure, IoT developers need to get acquainted with the art of creating AI-powered IoT applications that can help their clients make better use of data insights. Interestingly, the combination is expected to do wonder. Data-driven business approach is helping businesses to drive production, brand awareness, customer acquisition, customer service and, ultimately the business ROI (return on investment). Citing the improved capabilities and benefits of IoT, more and more businesses are to adopt Internet of Things, and it seems the vibe is right as more and more investors are taking interests in businesses or startups that are emphasizing on digital transformation. Intel Capital, Sequoia Capital, and Google Ventures, to name a few, are the key investors in the Internet of Things space, according to Pitchbook. To gain competencies, businesses are increasingly focused on adopting data-driven IoT mobility solutions. Indeed, a combined use of disruptive technologies like Internet of Things, AI, machine-learning, etc., can help them, provided the objective is pursued with due diligence and prudence.